Sorry for the late post this week, it's coming to you from the hazy world of head colds. Last weekend was my father-in-law's birthday and as per usual he requested a sponge cake with cream and fresh berries. This didn't surprise me but at first I was thinking, 'Damn I just made that kind of cake'. 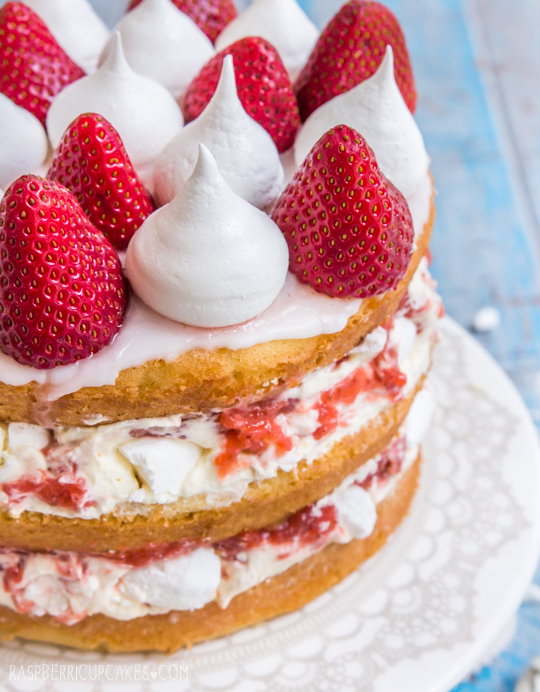 But then I had a small jolt of inspiration; if I used strawberries and cream and added some meringue to the cake I could make a cake inspired by one of my all-time favourite desserts, the Eton mess. This cake is made up of layered sponge flavoured with rose water, vanilla bean whipped cream, crushed meringue and a thick strawberry sauce. You cannot go wrong with that. Eton mess is pretty much the ideal dessert for a baker like me. It's fresh, easy and delicious even though it looks like an absolute mess on the plate. I always love the mix of all the textures and flavours in it, with the fresh berries, tart strawberry sauce, crunchy meringue bits and fluffy whipped cream. This works really well for a naked layered sponge cake because it keeps it super light but still interesting (perfect for capping off a home-cooked roast dinner in the middle of winter, trust me!). And it's good for messy bakers because it doesn't matter if it looks a bit rough, it's supposed to be like that! I was puffing my chest out feeling so original about this idea until I went back to look at the cake I baked for the same occasion last year and realised that it was nearly identical in presentation, right down to the topping of fresh berries and meringue cookies. Damn. It does taste completely different though. It's fairly messy once you start cutting into the cake, but I think that makes it extra appropriate for its title. Brush three 18cm (7 inch) round cake tins with melted butter, line base and sides with baking paper, grease paper with a little extra butter and then dust lightly with flour. Carefully pour equal amounts into prepared tins and bake until light golden and centre springs back when pressed lightly with your fingertip (about 20 minutes). Pull cake gently away from sides of tin with your fingers or carefully loosen with a knife. Turn onto a wire rack, remove baking paper, turn back over swiftly and cool completely. Optional: I placed 1 tbsp rose water, 1/2 cup sugar and 1/2 cup water in a saucepan and stirred it over medium heat until it formed a syrup, poked holes through the cakes using a fork and brushed the syrup over the cakes to give it light rose flavour. This part isn't necessary but adds an interesting touch. Preheat oven to 120°C (250°F) (100°C (210°F) fan-forced) and measure all your ingredients. Line two baking trays with baking paper. Place egg whites and salt in a large, clean mixing bowl and beat with an electric mixer until soft peaks form. With the mixer on low, add sugar 1 tbsp at a time then whisk on high until thick and glossy (at least 5 mins). Place in oven and reduce oven temp to 90°C (195°F) (85°C (185°F) fan-forced). Leave the oven on for 60-75 mins or until the meringues are crisp (mine took longer but I prefer to leave them longer at a low temp than risk them browning at a higher temp), then turn off oven and allow the meringues to cool completely in the oven (2-3 hours). Place strawberries, sugar, lemon juice and vanilla in a medium saucepan and place on medium heat. Stir over heat until sugar dissolves. Mix cornflour and water together in a separate small bowl then add to the saucepan and stir over medium heat until mixture thickens, about 3-4 minutes (if mixture becomes too thick, add water 1 tbsp and stir until it reaches the right consistency). Set aside to cool. Place cream, icing sugar and vanilla bean seeds in a large mixing bowl and beat on high until it reaches stiff peaks. Use a sharp, serrated knife to level the tops of your sponge cakes. 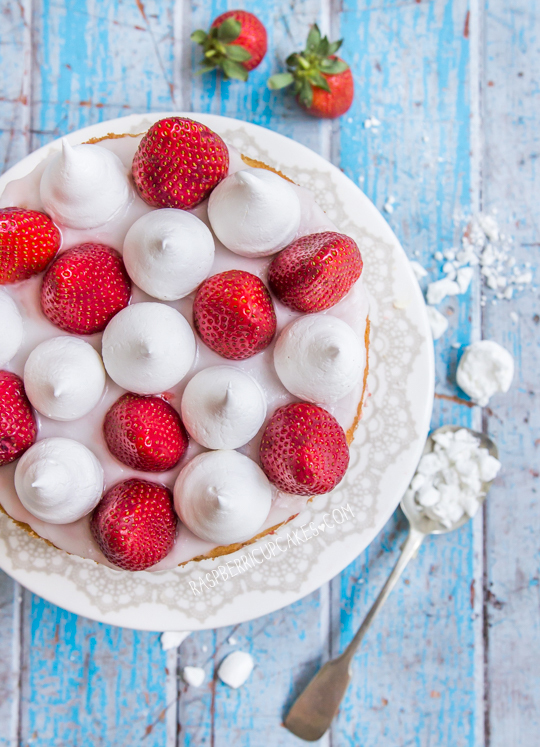 Place first cake layer on your serving plate or stand and top with a thick layer of cream swirled together with dollops of strawberry sauce and crushed meringue cookies (ensure you retain enough meringues to decorate the top of your cake). Keep filling about 1 cm from the edge of the cake to stop mixture from overflowing when you sandwich layers on top. Sandwich with another cake layer and repeat. Mix together icing sugar with liquid to form a thick, smooth paste for the glaze. Spread over the top of your cake using a spatula. 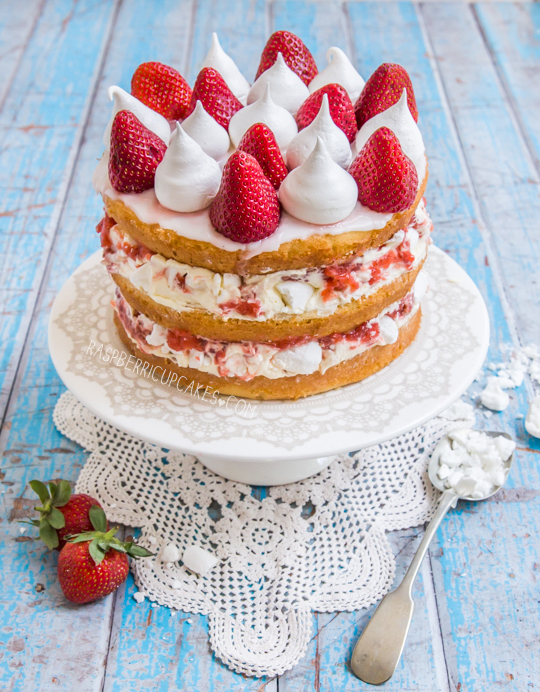 Decorate with fresh strawberries and meringues. Place in fridge to allow glaze to set and store there until ready to serve. Can be served with extra cream, sauce and meringue cookies. Sounds delicious - can't wait to try it! So cute! i have bunch of strawberries at home too; Eton mess is one of faves to make with it. What beautiful pictures! I would love to just tuck into the cake right now ... 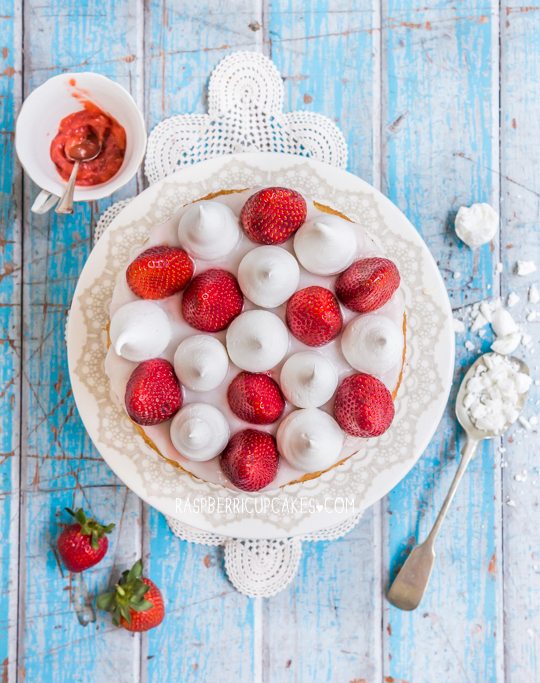 The strawberry-sized meringues on top are ingenious! So pretty and fresh and the strawberries have been so lovely and sweet lately! Looks amazing. Thank you for sharing! Hello cake! 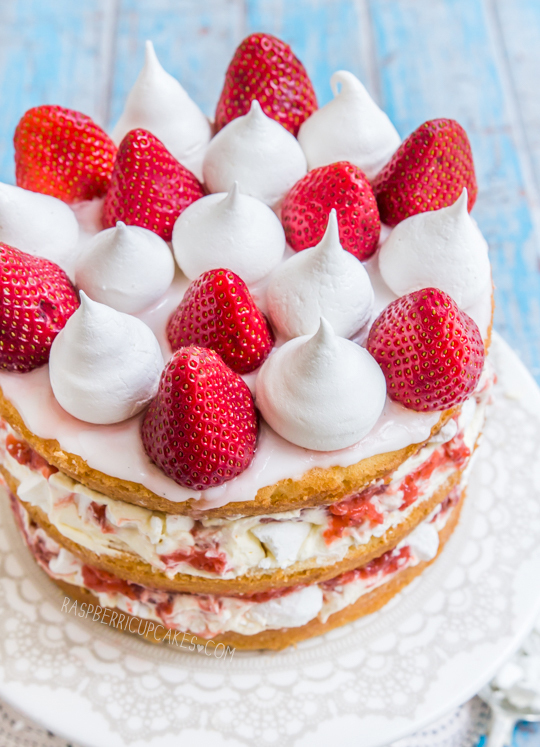 This looks incredible, I just adore the strawberries and meringue on top - its so beautiful, it belongs in a cake shop! I'm a big fan of Eton Mess - it's always such a light and fresh dessert option. This cake looks descrumptious! Eton mess is one of my all time favourite desserts, probably because it's the only acceptable dessert to be served with a mountain of cream. 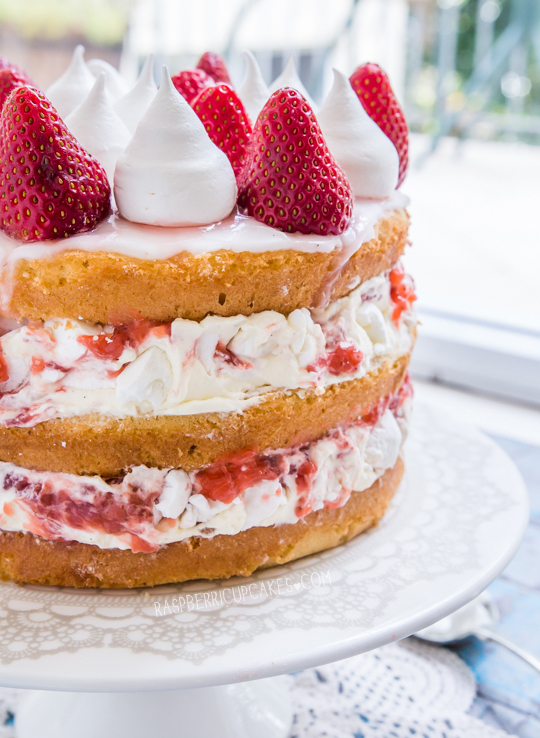 This cake makes eton mess much more acceptable for a civilised occasion! I LOVE Eton mess, but it's never occurred to me to turn it into a cake! Obviously I have been wasting my life, because this looks ah-mazing! Oh, isn't it beautiful?! Would be perfect for a picnic in the Spring weather. I love this! Such a great mix of flavours and textures.